This feature allows you to create groups/teams/categories (like sales, support, marketing etc.,) and add agents to each department based on their skill/specialisation. On the pre-chat form, visitors can choose the department to which they want to connect with and the chats will be routed only to the agents in that particular department. This feature is available in Mighty and above plans. Only admin users can create departments and group agents to it. How many departments can I create under each plan? 1. Go to Manage >> Pre-chat form >> Departments >> Click on "Add a department". 2. 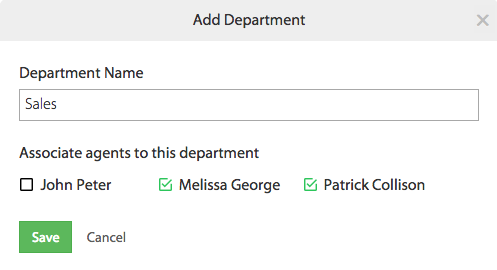 Enter the "Department Name" >> Select agents based on their specialisation and add to the department by clicking the check boxes >> Click "Save". 3. Depending upon the subscribed plan, you can create departments. 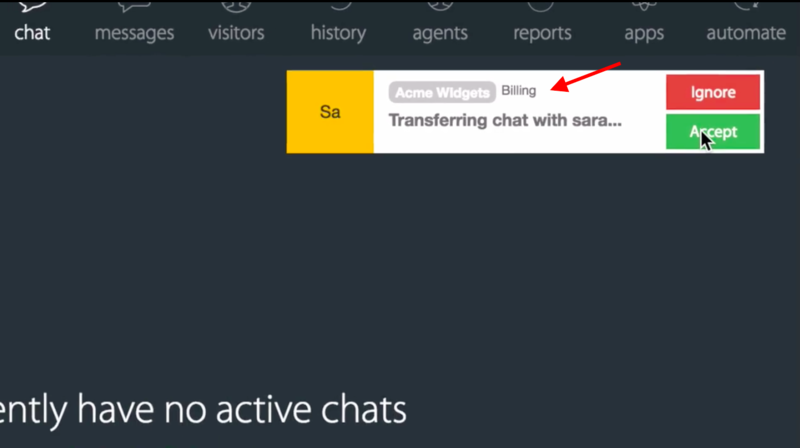 By Toggling ON, visitors can choose the department name in the pre-chat form, so that the chats are routed only to the agents in that particular department. 1. 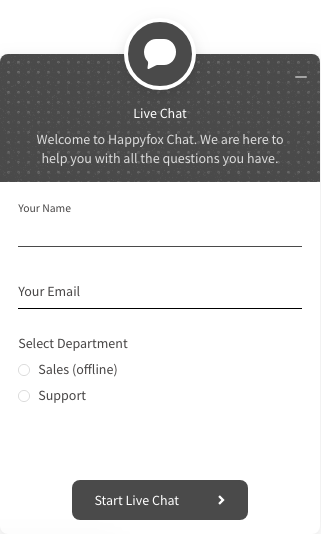 Log in to HappyFox Chat account. 2. Go to Manage >> Click Pre-chat form >> Toggle ON 'Allow Visitors to Choose Departments' . How to send chats to a specific department? 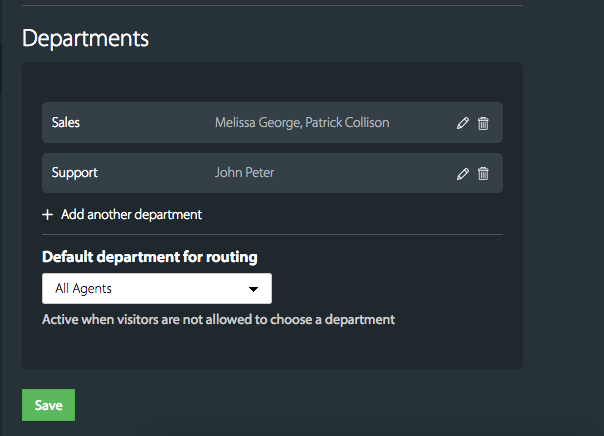 Toggle OFF the option 'Allow Visitors to Choose Departments', you can either broadcast the incoming chat to all agents or a particular department by choosing the department under "Default Department for routing" option. When there is an incoming chat notification, the incoming chat request will bear the name of the Department so that the agent shall identify, which department the chat request is for. In the chat window, the department name will be displayed in the chat information box above the chat window. 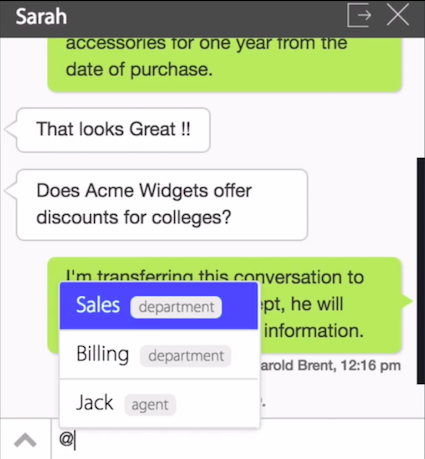 Agents can transfer the chats to other departments if customer has questions on it during the chat. Just type "@" in the chat area and choose the department. Trasferred chat notification will be broadcasted to all the agents in the transferred department. In the History section, the department name will be shown for each transcript on the right side along with other meta data.